In what is now known as the western Middle East was a place called Canaan. About 4000 years ago Abraham, a goat herder in those parts, began to expand the current views about pagan gods with another view. Actually it was Abraham who introduced Judaism as the first religion with only one God. The early periods of the Bible still referred to many pagan rituals, such as sacrifice of animals, as being part of their culture. 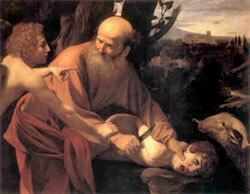 Genesis speaks of how God commanded Abraham to sacrifice his son as proof of his love of God. Thankfully at the last minute God let him substitute a ram so Isaac was spared. This was a major change in philosophy, and marked a new course in the relationship between God and man. Yet, sacrifice in one form or another is still an integral part of some religions today. In fact, a large component of many religions is the concept of sacrifice -- the giving-up of an asset, something of value, for the purpose of reconciliation. Thankfully most "sacrifice" today is more intellectual, and less overtly physical. But we still must pay for our sins and follow rituals that are in many ways symbolic of those early practices. And surrendering our will to God is in fact a deep, internal decision that involves sacrifice. The relationship between the Jewish God and man was evolving. Abraham's followers still saw God as mysterious. He would not reveal himself in any concrete way, and the Jewish Bible follows this theme. 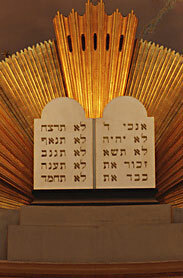 The Jewish word for God isYahweh (pronounced Ya-way). So, God is here, but not here, and man may search, but perhaps cannot find Him. Yet, man cannot stop the search. He is compelled to keep looking. This mystery and irony in our search for God pervades our view of faith today. Yet, it is our nature to try and put a face on God‚ to attempt to create icons and images that make God more tangible, and more real. Yet, God constantly resists, and actually forbids this practice. "I am the Lord thy God. Though shalt not have any other gods before me." "You shall not make for yourself an idol." These admonitions are common to Christian, Islam, and Jewish religions. This paradox pervades every religion's attempt to know and define God. It may be one reason that Buddhism resists the temptation to acknowledge God, and to give God a name, or give God a description. This struggle is fundamental to the beliefs systems of all religions, and in many ways define the differences between them. 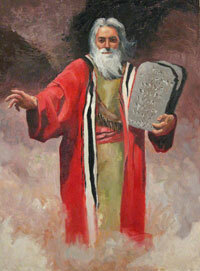 The defining event in Judaism is when Moses climbs Mt. Sinai, and talks with God. Of course God is still enveloped in clouds, and cannot be seen, but God does talk directly to Moses, and Moses gets to know His nature. This is where God finally lays down the law in the form of The Ten Commandments. From then on, these definitions of right and wrong, defined by The 10 Commandments, will be the defining characteristics of God, and what makes this religion different from another. 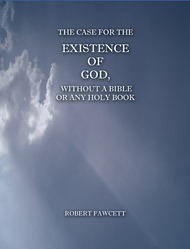 And our SPECIAL REPORT, The Case For The Existence Of God, gives an understanding that, from the beginning, "All human beings -- regardless of either where they live or what religion they may have been raised under -- have a natural longing for God."